What would you do if you heard that a rumour about you has been spreading? What would you do if you heard that 100 people have heard the rumor? What if 1.000 people heard it? 1.000.000 people? 10.000.000 people? A continent’s worth of people? Just recently a rumor has been circulating that Facebook is shutting down because its founder Mark Zuckerberg is tired running it. He doesn’t care about the USD 50 billion value of the social network website, not to mention the 500 million that Goldman-Sachs has just poured into Facebook, and he just wants his life back. I got online and went to Facebook.com to see if they have issued a statement regarding the rumor. When I got there, I was puzzled. I expected a big announcement, or a banner, or at least a box containing a big title, “FACEBOOK IS NOT CLOSING” with link to the lengthy and detailed document rebutting the rumor. Just another status on the wall. They didn’t make a big deal out of it. This wasn’t the first rumor about Facebook. A while back, Facebook was said to go fully commercial and it would collect fees from its users. Another rumor said that it was closing down because its servers could not cope with the millions of users that used it every day. 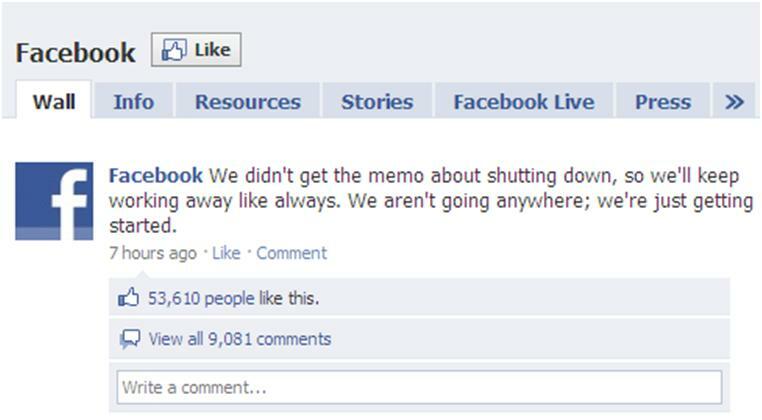 It was also said that Facebook used photos and data of its users for its advertising without consent from the owners. All of them proved to be untrue. Hence, the nonchalant attitude. Facebook treated the rumor just like any other rumor it had faced in the past. They did not worry about it, instead they kept working as usual. There is a good saying that goes, “If you want rainbow, you have to put up with the rain.” If you want success, you will face rumors and bad mouthings. With over 500 million users, and its recently beating Google to earn the title as the most visited site in the US in 2010, it is just natural that Facebook became a magnet for rumors and envy. It will be difficult to expect that you can achieve success without making some people envious. When it happens to you, just remember to keep working as usual. You have somewhere better to go and something more important to do than to brood over the untrue rumors about you.